Quince Trees are easy care and come in a number of varieties. They are grown both as ornamental trees and also for the delicious fruit, used for cooking or jam. Quinces or Cydonia Oblongata are not always readily available in fruit shops or markets, however they are easy to grow in the home garden. Growing your own Quince is a great way of providing fresh fruit being available. Very easy trees to grow, readily available for sale online and once established will crop heavily. These are a hardy, easy care deciduous trees take well to pruning. They fruit well on a small contained tree. In Australia quinces are harvested in Autumn as they turn yellow. Quinces are used for cooking (usually stewed or roasted), making jams,and jellies and for making cider. The thee most commonly grown varieties of quince trees are Smyrna, Champion and Angers. Smyrna is the Turkish variety as the name suggests, excellent fruit for cooking and an attractive tree. Will fruit when young. Angers is a French variety, a smaller tree with fruit that stores very well and is again excellent when cooked. Requires cross pollination for good fruit set. Other varieties include : Fullers and Mummery’s Seedling. Quince trees are available on dwarf rootstock, they are also available as multigraft trees. You will also find trees grafted onto dwarfing rootstocks, excellent for those with smaller gardens. In terms of height a quince tree can reach up to 5 meters, however in containers they will remain smaller. Some varieties may also be grafted onto dwarfing rootstock which will keep the overall size smaller. Although Quince trees do not require much pruning, they will benefit from some thinning. You can improve fruit production by opening up the centre of the tree a little. Cherry Slug – These slugs eat the foliage and they over winter in the soil beneath the tree. 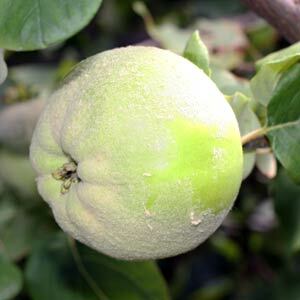 Fleck – This is more prevalent in humid areas. If you remove all fallen leaves and fruit as they appear, and then burn them you can reduce the problem. Some resistent varieties are also available.